The surface is smooth, blue-green or steel blue. The sites are purple, and the upper surface face is marked with numerous short rows or lines of lines of dark ruby points which branch in net fashion. Origin and Habitat: Van Rhynsdorp district, Cape Province, South Africa. 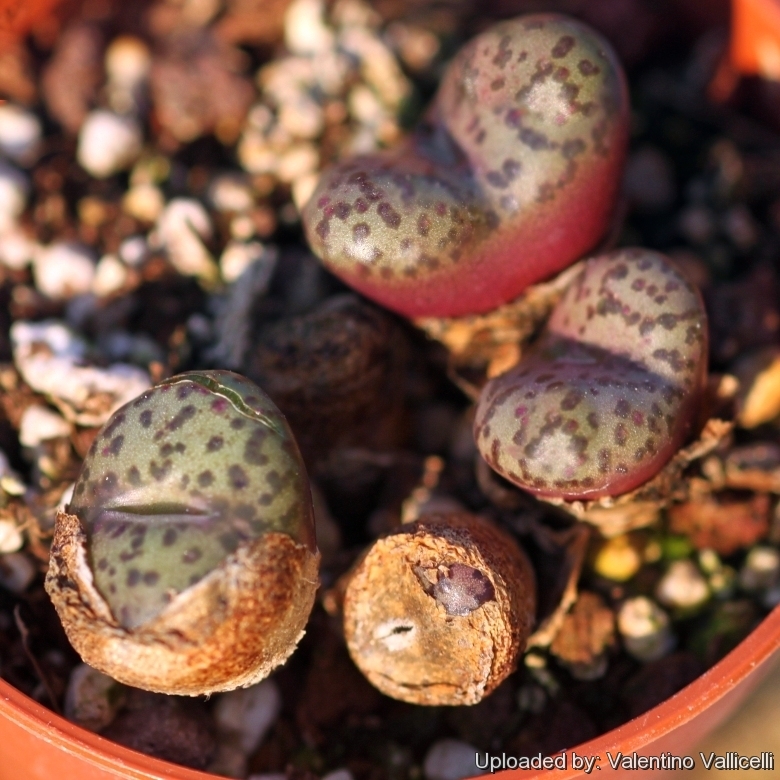 Description: Conophytum obcordellum is a very variable species with tiny pancake-shaped bodies marked with few to many coloured dots and lines. It comprises several questionable varieties and its taxonomic history has undergone several changes. Conophytum obcordellum fa. multicolor, formerly known as Conophytum multicolor, is a particularly colourful form of C. obcordellum, distinguished through its particularly lively, grey-green almost metallic colouring, and the sides and the markings on the top of the body are dark purple. The rest of the features are fully identical with C. obcordellum. Dark purple colouring is also evident in Conophytum obcordellum fa. picturatum. Conophytum obcordellum fa. Multicolor is one of the prettiest and priced forms. Bodies (paired leaves): Inverted-conical to almost pancake-shaped, 10-15 mm tall, 8-12 mm in diameter, top flat or slightly convex, the edge often rolled significantly. Surface smooth, blue-green or steel blue. Sites usually purple, upper surface face marked with numerous short rows or lines of lines of dark ruby points which branch in net fashion. Flowers: Often paired, large white or creamy with a pale yellow centre. The thin petals form an almost star-like, spidery structure, they are aromatic and very showy. Blooming season: Blooms mostly in autumn (in cultivation in Europe August-November). The flowers are numerous and open at night. Conophytum giftbergense Tischer: has larger bodies with smaller, not merging less lively coloured dots. Conophytum lambertense Schick & Tischer: is a small coastal form. Distribution: Lambert Bay, Western Cape province of South Africa. Conophytum obcordellum var. ceresianum (L. Bolus) S.A.Hammer: has very finely splattered markings and forms a dense mat. Flowers cream colored often with pink staminodes. Conophytum obcordellum f. multicolor (Tischer) Tischer: has grey-green almost metallic colouring, and the sides and the markings on the top of the body are dark purple: Distribution: Van Rhynsdorp district, Cape Province, South Africa. Conophytum obcordellum subs. rolfii (de Boer) S.A.Hammer: Leaves very small greysh-green to reddish with coarse fine lines and reddish papillae (The most heavily papillate member of the group) Distribution: Vredendal, Western Cape. Conophytum spectabile Lavis: has small bodies with exquisite markings. 5) Hammer, S. 2002. “Dumpling and His Wife: New Views of the Genus Conophytum.” East Anglia Engraving Creative Colour Ltd, Norwich, England. Cultivation and Propagation: Conophytum obcordellum f. multicolor is easy to grow. These plants grow on winter rain and head for summer dormancy. More or less dormant in summer. The plant requires little water; otherwise its epidermis breaks (resulting in unsightly scars). Water throughout the year although minimally in summer, (only when the plant starts shrivelling), but it will generally grow even in summer if given water. Water regularly in winter after the previous year's leaves have dried up. Requires good drainage. Keep cool and shaded from hot sun in mid-summer; it needs full sun or light shade in the other seasons. Hardy to -2°C. Ensure a very good ventilation. Avoid to repot frequently. This plant may stay in the same pot for many years. Plants grown in larger containers have frequently relatively poor flowers. It might improve when the plants are given their own, small individual pots.